Last week, a fire broke out in a mall, located in Kemerovo, a remote city in Siberia, on a day that happened to be the beginning of family holiday time, killing 64 people. The mall, replete with a bowling alley, trampoline, movie theatres, was filled with children, who comprised a majority of the victims, perishing in the toxic smoke and blaze, their cries of lament and despair caught on security camera, as they faced mysteriously locked doors. Many of these innocent victims were buried on Wednesday of Holy Week, in what some may have seen as a rather unwilling participation in the our Lord’s own passion. One can scarcely imagine the parents’ lament, with Rachel, weeping for her children and refusing to be comforted, for they are no more. Evil and pain, especially of this magnitude, is always a mystery, that whole mysterium iniquitatis, of which Saint Paul writes. 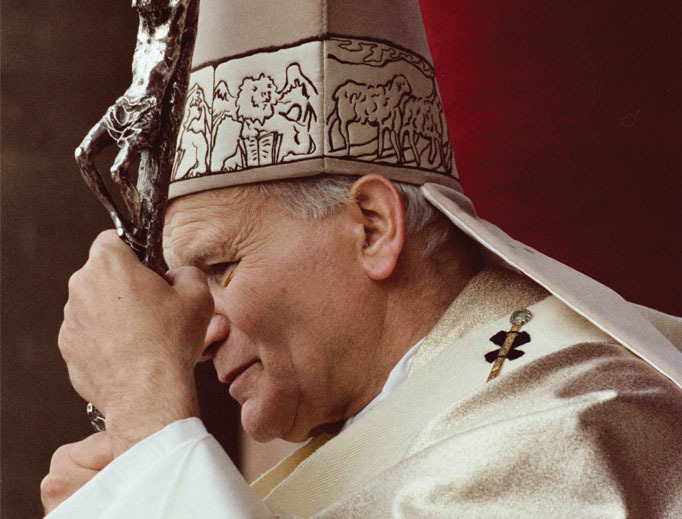 In 1984, Pope Saint John Paul II penned an Apostolic Letter on the nature and purpose of human suffering, Salvifici Doloris (curiously, now looking back, the same year he made his first apostolic journey to Canada). As we reflect on this Good Friday morning on all the evils of the world, taken up by Christ on His Cross, all the tragedy of war, terrorism, abortion, the persecution and enslavement of Christians, the daily crimes against life, and all the other tragedies of our world, as I re-read John Paul’s letter, an unsurpassed synthesis and summary of the Church’s teaching on the mystery of suffering. We suffer, says the Pope, when we are in the presence of an ‘evil’. But we should be clear that evil has no positive existence, but is rather a state in which a good is missing, which should normally be there, what we call the privation of a good. The more desired is the missing good, the greater will be the experience of evil. The Holy Father emphasizes the subjective dimension of evil, that its primary locus is within the suffering subject, in what he evocatively terms the ‘world of evil’. The exterior dimensions of evil, hunger, aloneness, war, pains of the body, only give us some glimpse into what is occurring within the person. These so-called physical evils, wherein something objective is ‘missing’, are really only one of the gateways, if you will, to ‘real’ evil, spiritual or moral evil, deep within the identity of the person, in their ‘soul’. What really is the definitive evil that Man can experience? Most might say that this is ‘death’, the dissolution of the body, the very cessation of existence itself, or so they think. As the Pope says, death indeed has a “definitive and total character” but is also “in a certain way…beyond all forms of suffering”. While death may seem to be the ‘ultimate’ evil, especially death at the very dawn of life, we must ask ourselves whether this is really true, in light of what Christ has revealed. Man is an immortal being, whose life and actions here and now in some mysterious way determine his eternal destiny, and Christ made it clear that we will be ‘judged’ at the end of our lives on love. Not some emotional, vaporous, self-indulgent love, seeking in subtle ways our own selfish good, but divine, real, sacrificial love, ‘willing the good of the other’, as Saint Thomas put it, or ‘loving our neighbour as ourselves’. There is nothing that so evinces, and is so requisite to, love than the willingness to sacrifice and suffer for the one whom we love. I am more or less convinced that at some level every person knows this truth, even in some inchoate way, that we all will be judged on whether or not we have truly loved, and the real evil is to reject this love, to live a life of hatred of others, subtle or not, closed in upon oneself in bitterness and anger. To live in this state for eternity is what the Church means by ‘hell’, in the words of the Catechism, “the state of definitive self-exclusion from communion with God and the blessed”. This is the real ‘evil’ from which Christ, become Man, willed to save us. Of course, Christ Himself did not ‘need’ to suffer, and Saint Thomas declares with logical clarity that He could have redeemed us some other way. However, the Way He did choose was the most fitting, the most perfect, both to redeem all of our own ‘evils’ at their very root, and to offer us a way to follow that He Himself trod, in all the weakness of His humanity. Christ does not need our sufferings, but allows us to suffer so that we might participate in His redemptive work for our own sake, so that we become more conformed to Him, hence to God. As John Paul puts it, through suffering those surrounded by the mystery of Christ’s Redemption become mature enough to enter this Kingdom. A sobering, but joyful, thought. One final note: Just as Christ could suffer for others, while needing none himself, so too we can suffer for others, even if we need it not. This is the mystery of our unity in the Mystical Body of Christ, and why innocents like Christ, our Lady, and, yes, saints and even little children can suffer, in fire, war and famine. Such vicarious suffering can ‘make space’ in the sin-hardened and deadened-conscience souls of others for the redemptive grace of Christ, even if they refuse to ‘make space’ themselves. Of course, this is nowhere near the modern, utilitarian mindset, which sees all things governed by blind chance, with life nothing but a protoplasmic accident waiting to return to the oblivion whence it arose. To them, suffering makes no sense, and that those children just happened to be in the wrong place at the wrong time. But to the Catholic mind, there is always a reason, and nothing really happens by ‘chance’, for all things, from the smallest to the greatest, are in God’s providence (CCC, #303). To the victims of such manifest evils, such was their moment to enter eternity, their suffering ‘meaning something’ in the grand scheme of God’s providence, a meaning to be revealed only at the end of time, when the whole creation will be brought to perfection. Thus we reach the limits of our understanding of the mystery of salvific suffering, stretching out towards the eternity to which we are all called after this transitory existence. Life here is only a ‘penultimate good’, as John Paul would later state in Evangelium Vitae, not the ultimate good, which is eternal life. That is why he could declare that all the heinous crimes against life, abortion, genocide, terrorism, mutilation, murder do more harm to those who practise them than to those who suffer from the injury“(par. 3), a rather startling statement, when one thinks of it, but which makes sense when we compare the transient ‘evils’ of this life, with what recalcitrant persistence in mortal sin can do to us in eternal life: do not fear those who kill the body but cannot kill the soul; rather fear him who can destroy both soul and body in hell.